Dayton Bombers forward Chanse Fitzpatrick became the 25th player in ECHL history to net five goals in a game, and he did it all in one single period. Three games into the season, Dayton Bombers forward Chanse Fitzpatrick wasn’t getting any bounces or breaks. The frustration was starting to reach alarming levels. Two periods into last Saturday night’s game against the Trenton Devils at the Nutter Center, the Bombers found themselves in a 1-0 hole. Nothing continued to go right for Fitzpatrick, who had been acquired from the Phoenix Roadrunners over the summer for his scoring touch. Fifty-two seconds into the third period, everything changed. Fitzpatrick scored his first goal of the season on the power play to tie the game. A little over two minutes later, he scored again to put the Bombers in front. But he wasn’t done – far from it, in fact. Fitzpatrick would score three more times in the final five minutes, picking up power-play tallies at 15:03, 16:20 and 17:34. That’s right. Five goals in one period. So much for a slow start. 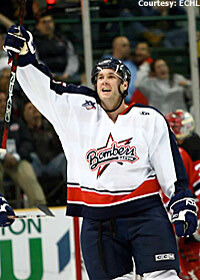 Incredibly, Fitzpatrick became the 25th player in ECHL history to score five goals in a game. Chris Minard last accomplished the feat, with the Alaska Aces on Jan. 8, 2005, against the Victoria Salmon Kings. Four of his tallies came in the opening period. It marked the second time in Fitzpatrick’s life that he was able to find the back of the net five times in a game. He said he also had the same amount of success when he was playing bantam hockey – which, ironically, was mentioned on the Bombers’ scoreboard prior to the game. To top it off, Fitzpatrick, a native of Prince Edward Island, had his parents in the building on Saturday. Bombers coach Bill McDonald said it was quite a sight from the bench, watching Fitzpatrick get into position time and time again to increase Dayton’s lead. McDonald was happy to see his player get rewarded after coming up empty in the team’s first three games. Trenton coach Rick Kowalsky felt the same way, although his reaction was more geared toward the fact that his team couldn’t stay out of the penalty box. The Devils were whistled for four minor penalties in the final 10 minutes of regulation. Fitzpatrick just was happy to contribute to a club that struggled out of the gate. The Bombers dropped their first two games of the season before picking up a 5-3 win over the Johnstown Chiefs Friday – just 24 hours before Fitzpatrick’s unforgettable night. Dayton dropped a 6-5 decision to the Augusta Lynx in overtime Wednesday, but remains 3-0-1 in its last four games. McDonald knows it will be a while before the ECHL – or any other professional league, for that matter – sees a performance like this any time soon. In the end, he was pleased to see Fitzpatrick get on the score sheet. Farewell, O.B. -- One team’s loss is another’s gain. Mike O’Brien, the Director of Public Relations and Broadcasting for the Trenton Titans/Devils since 2003, is moving up within the organization. O’Brien will call his last T-Devils game tomorrow night at Sovereign Bank Arena before becoming the new Director of Team Media and Services for the Lowell Devils of the American Hockey League. Being a former Trenton beat reporter, this certainly is a well-deserved promotion for O’Brien. He is a tireless worker who did anything the club asked of him. Good luck, O.B. You will be missed. Around the ECHL – The Pensacola Ice Pilots acquired goaltender John Daigneau from the Idaho Steelheads on Thursday in exchange for future considerations. Daigneau went 1-0-2 with a 2.94 GAA in three starts for Idaho. … The Utah Grizzlies tabbed Jim McKinnon as new president and chief operating officer. … The Phoenix Roadrunners acquired forward Ryan Walsh from the Gwinnett Gladiators Wednesday for future considerations. The 27-year-old had two points in six games for Gwinnett. … The Wheeling Nailers sent rookie forward Jason Tejchma to the Mississippi Sea Wolves Wednesday for future considerations. He had one goal in five games for the Nailers. … Phoenix forward Daniel Sisca was named the Player of the Month for October. He had four goals, four assists and a plus-4 rating in five games. Brian Compton can be e-mailed at: bcompton@nhl.com.